Made in fair-trade factories, theses super soft organic cotton pyjamas are gentle against your little one's delicate skin and snuggly warm, perfect for colder weather. 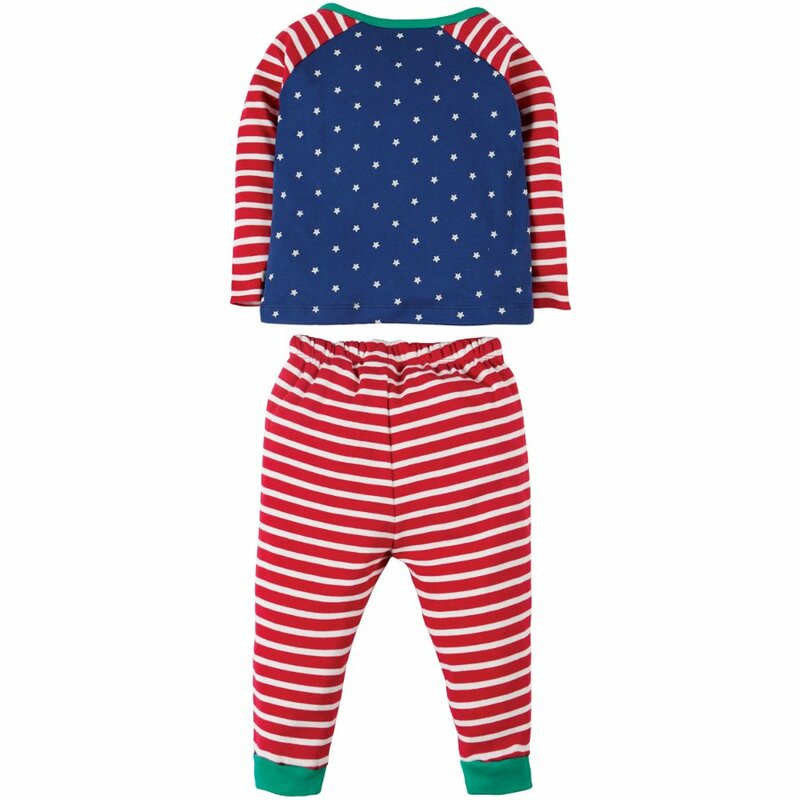 The gorgeous top has a blue background with white stars, a colourful santa and reindeer train appliqué, red and white striped sleeves and popper fastenings to the side of the neck. With a touch of extra elastane in the cuffs and elasticated waist for extra comfort, the striped pull up bottoms make this the perfect set for comfortable sleep. Organic cotton feels super-soft because the fibres are left intact and not broken down by the chemicals used in the farming and processing of conventional cotton, making it much kinder to babies and young children’s delicate skin. No harmful chemicals or dangerous dyes are used so organic cotton is less likely to trigger allergies as well as being more durable, lasting so much longer enabling you to hand it down for generations! Everything is made in fair trade factories where employees are given a fair wage as well as access to a free GP for them and their families. Machine wash on cool with similar colours. Do not iron. Do not tumble dry or dry clean. Do not bleach. 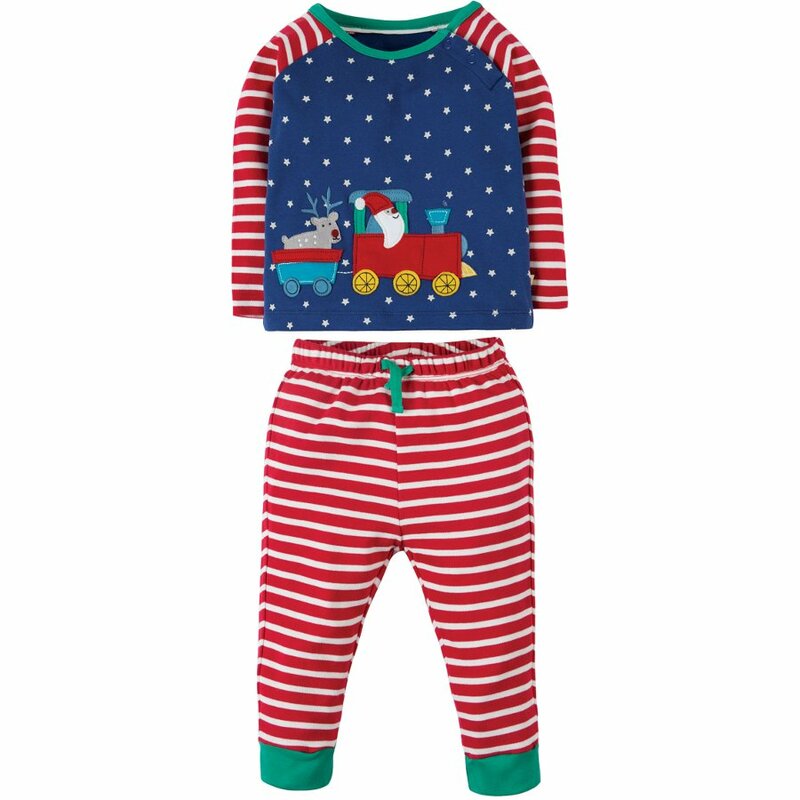 There are currently no questions to display about Frugi Stargaze Pyjamas - Train.